Hull City climbed back into the Championship play-off zone with an away win which left Bristol City rooted in the bottom three. Tigers forward Sone Aluko fired in an early opener after combining superbly with Jay Simpson, before Steven Davies smashed the hosts level. 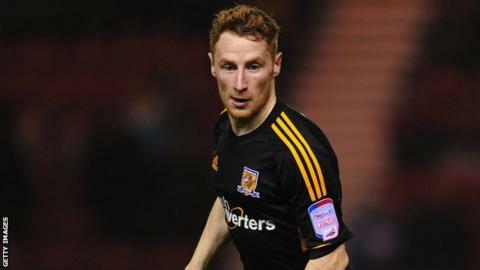 However, calamitous defending allowed Stephen Quinn to poke in Hull's winner with help from a Cole Skuse deflection. Defeat means Bristol have failed to win any of their last seven league games. The Robins started brightly, but soon fell behind when Aluko and Simpson exchanged a series of short passes on the edge of the penalty area for the ex-Rangers man to convert. Hull boss Steve Bruce watched his team continue to enjoy the majority of possession and they looked comfortable as they stroked the ball around the pitch. However, the hosts began to find their feet and levelled when Stephen Pearson's pull back was drilled into the back of the net by Davies. The encounter became an even affair after the equaliser with Simpson squandering a great opportunity to re-establish Hull's lead before half-time, before goalscorer Davies just failed to reach Ryan Taylor's teasing cross with an outstretched foot at the start of the second half. Tigers skipper Robert Koren shook Tom Heaton's crossbar a few minutes later with a crashing 25-yard thunderbolt. But confusion between Heaton and Skuse left the hosts unable to deal with a soft attempt from Quinn and the ball crept over the line with the help of the defender's arm.